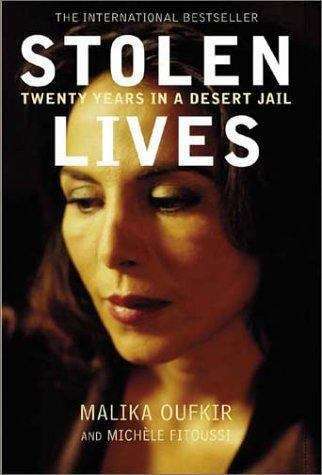 From the book jacket: Malika Oufkir has spent virtually her whole life as a prisoner. Born in 1953, the eldest daughter of General Oufkir, the King of Morocco's closest aide, Malika was adopted by the King at the age of five, and was brought up as the companion to his little daughter. Spending most of her childhood and adolescence in the seclusion of the court harem, Malika was one of the most eligible heiresses in the kingdom, surrounded by luxury and extraordinary privilege. Then on August 16th, 1972, her father was arrested and executed after an attempt to assassinate the King. Malika, her five siblings, and her mother were immediately imprisoned in a penal colony. After fifteen years, the last ten of which they spent locked up in solitary cells, the Oufkir children managed to dig a tunnel with their bare hands and mare a daring escape...though they were recaptured after only five days of freedom. Malika was finally able to leave Morocco and begin a new life in exile in 1995. Stolen Lives is a heart-rending account of resilience in the face of extreme deprivation, of the courage and even humor with which one family faced their tormented life. A shocking true story, it is hard to comprehend that it could have happened in our own times.